To better understand the needs and interests of the WheatCAP graduate students we conduct annual surveys. The complete results are here and below we show the responses to some selected questions. Question 1. How confident are you in the following knowledge areas? Question 2. Are there any other knowledge areas in plant breeding you feel are important? Machine learning and genome editing. I believe that the ability to communicate with growers is important in the breeding process as well. I feel understanding how to exploit new technologies like CRISPR/cas-9 in breeding for improved trait and disease will be very crucial in coming days. I think it is important for a plant breeder or plant breeding student to be knowledgeable of intellectual property (PVP, licensing, etc.) and regulatory affairs (APHIS, USDA, etc.) related to the topic and industry. Field work, literature analysis, and understanding/interacting with a crop’s value chain. Whole-genome regression models are increasingly important in plant and animal breeding. I feel that many producers and consumers are unsure of new genetic technologies. It would be useful to learn how to successfully communicate with a general audience about this. One-on-one training with a field breeder. Question 4. How confident do you feel in the following skill sets? Question 9. 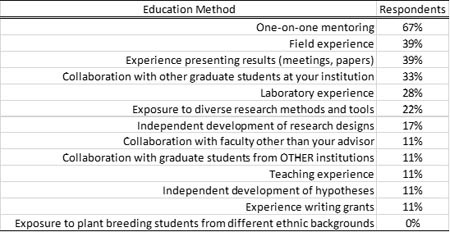 In your opinion, what are the three best methods for educating graduate students?